Today is a birthday of sorts. I am nine years old. Well...my blog is anyhow. On August 10, 2007 I started my online presence when I put up my first blog post on The Altered Page. I had a vision in mind and strangely, as you can read in the text of my first post pasted below, that vision remains the same today. "Welcome to The Altered Page. 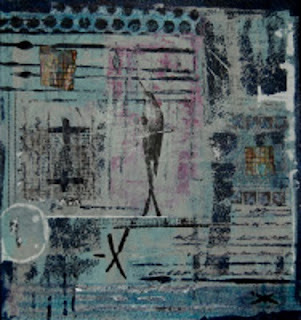 I see this blog as one more element of my mixed media artwork. Much like the paper, gesso, acrylics, and other components of each piece, I believe the conversation that I am hopeful that this blog will generate will become an integral ingredient to the creative mix. I have been involved in mixed media art, book binding, photography, and mail art for about 4 years. 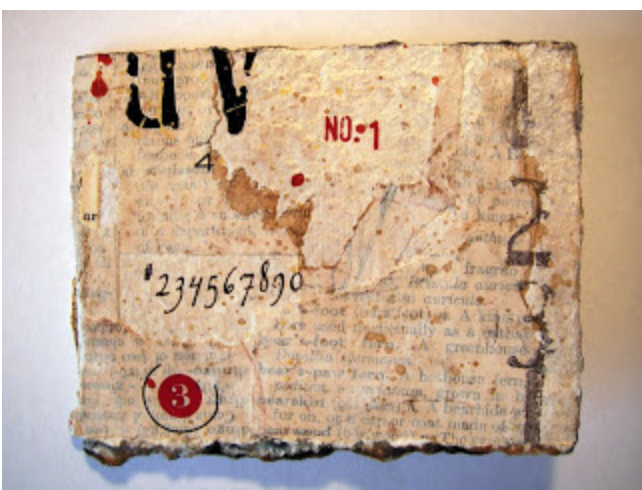 I love to include old, distressed and rusty found objects, text, layers and texture in my art. Over the past 1 1/2 years I have participated in a number of swaps through Yahoo Groups, an experience that has greatly widened my artistic community and allowed me to see first hand so many different creative styles. I also feel lucky to be living in New York City, where there is amazing art everywhere you look. Right now, I have 3 goals in mind for this blog. First, to share my art and receive feedback in return. Second, to share artists, websites, stores, books, ideas, and creations that I have found. And third, to share great art finds from the museums, galleries, and streets of New York. Thanks for coming along for the ride!" I call this a birthday, rather than an anniversary, because my life as an artist was in many ways started with my first blog post. As I always say, I would not be where I am today without the Internet and the community that I have connected with as a result. I would not be the same without all of you! As I have grown up, my online connections have been extended from my blog to so many other platforms - Facebook, Twitter, Instagram. YouTube, Periscope, and the like. But the common denominator is YOU. And for that, I send out my thanks, my appreciation, and my endless gratitude. Thrilled to have gotten to know you through your blog and awesome workshops. You have expanded my thinking in creating. Just finished another set of cards! I hope you will get back to Paducah one day soon. Happy birthday and a big thank you to YOU! You have been so generous with sharing your knowledge and time (replying to questions, etc.). i look forward to many more blog birthdays for you! Congrats!! You are a very advanced nine-year-old Seth.....but then you started off with a very clear vision, and the obvious skills to achieve your goals. Congratulations! altogether now.. "happy Birthday to You..."
I would say that you must have been blowing out all your candles because you are certainly meeting your goals and we are all a testimony to your wishes! Thank YOU! And a very happy 9th to you!! Thank you for sharing your work, vision, expertise, time and heart with all of us. Your influence on my art has been HUGE. Your teaching and encouragement opened up a whole new world for me, and for that, I am grateful. Congratulations and happy anniversary. i find tghat your words from Art is you in Sydney are still popping into my head. If you do it once, do it twice. Don't overthink it, just do it. You may or not be happy with that but that's ok.It was a pleasure to be in your presence. I really enjoyed it. I hope to be able to take more of your classes when you are in Sydney again. Wishing you much joy and growth on this journey. Happy birthday! Thanks for sharing all your wonderful art! Congratulations and well done in staying true to yourself. Happy birthday! I have enjoyed reading your many posts and always appreciated your prompt replies to my comments. I am sure all your other fans do too. Wishing you continued and more success in your artistic endeavors. Happy birthday! I always enjoy your blogs & appreciate the lessons you've shared. Thanks for everything! Anyhow thank you so much for all that you do...and its a lot..
Congratulations! 9 years is quite an accomplishment. And your blog continues to be lively and inspiring! Happy birthday to the blog! Nine big ones -- and lucky us! i know it is a lot of work to keep it up and I really appreciate all the tips and info you share. Here's to the next nine years! Happy birthday!! And thanks a million for all you share so generously in your blog!! Happy birthday! Thank you for all you've shared with us and all you've allowed us to participate in through your blog. Wishing you many more! Congratulations to you!! As a fellow Blogger I truly appreciate your dedication to keeping your content always fresh and inspiring...which you do with grace and ease! Here's to many more years to come! Wow, Seth! How wonderful to take a look back and to share it with all of us who weren't there at the beginning. I loved reading your original mission statement and especially your three original goals. How wonderfully you have achieved those goals and how incredibly further you have gone beyond them! For these past nine years The Altered Page has enriched the lives of countless artists the world over due to the fact that you and your generous spirit were willing to take us all "along for the ride". Heartfelt thanks, Seth, for your constant, consistent support of mixed media art and artists and for everything you have done and continue to do! Happy Birthday! I, too, started my blog in August, but I'm only 7 (wink). I love your first posted image and I'm so glad that you have kept your blog going. I may not post often, but I am here. Your work is inspiring and in addition, I have been introduced to other artists and techniques thanks to the links you have shared about other artists.